Let’s take a walk for a moment. It’s Shavuot night; the festive meal has finished. Like so many other festival nights, you’d expect the events to play out in a familiar pattern. The guests head home, the older family members help clean up, but slowly, one by one, the family drifts off to sleep. But this night, something different happens. Rather than going to sleep, the members of the household stay up all night—and learn Torah. The obvious question is, why? What is so special about this night that so many people forego a night’s sleep to stay up learning instead? To understand this practice, we’re going to take a step back in time to the very first Shavuot—the day G‑d gave us the Torah at Mount Sinai. The giving of the Torah at Mount Sinai is one of the most fundamental and famous moments in our history. But any great event is only as momentous as the preparation that leads up to it. This story is about the preparation the Jewish people took the night before the giving of the Torah. This story remains a shameful part of our history—and it is at the heart of the custom of staying up late. In order to rectify our forefathers’ mistake, we stay up late every Shavuot night to show that our enthusiasm isn’t lacking at all. But there’s still much that remains to be explained. Who started this custom of staying up late? How widespread is it? Perhaps most importantly, why is it still necessary to rectify an event that took place thousands of years ago? To explain this, let’s start by taking a look at the sources for this custom. The custom of staying up late has developed in stages over the years. Tracing its sources leads us on a fascinating journey through our history and the many facets of the Torah. Let’s start at the Zohar, the earliest source for the custom. This ancient Kabbalistic work, written in the years after the destruction of the Second Temple, recounts that Rabbi Shimon Bar Yochai—the author of the Zohar—as well as “the early pious ones”3 would stay up learning Torah on Shavuot night.4 The Zohar does not mention anything about the Jews sleeping in, instead writing that this practice was a preparation for and in honor of the “bride’s” (the Jews) upcoming marriage to the “groom” (G‑d, or the Torah). However, the Zohar does mention that their learning was to help “fix” the bride. Our journey now skips over a thousand years, leading us to a fascinating occurrence that took place sometime in the early to mid-1500s in Turkey.5 Rabbi Joseph Caro, the author of the Code of Jewish Law, invited Rabbi Shlomo Alkabetz, the composer of the Friday night prayer Lecha Dodi, to his house to learn that Shavuot night. R. Alkabetz relates that, as they started to learn Mishnayot, R. Caro began to speak, his voice turned powerful and loud, his words sharp and enunciated. Those present instantly grasped that this was not R. Caro speaking. The voice praised them, telling them that their learning had pierced the Heavens and reached G‑d Himself. As their words ascended, the voice continued, the angels became silent, some standing still while others wept, all stopping to listen to the sound of their learning. This story quickly spread like wildfire throughout the Jewish world. So perhaps you’re sold. This Shavuot, you’re going to stay up and learn Torah. There’s one problem—the Torah is a pretty large collection of works. Where do you start? Can you learn whatever you want, or do you have to learn a specific volume? ● You should stay up until daybreak (alot hashachar), after which you can head off for some much-deserved sleep. 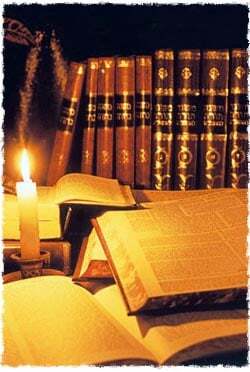 If you have sons, and they’re able to stay up late, you should encourage them to stay up with you.17 Though women are not obligated to stay up and learn,18 many women choose to do so, and there are often Torah classes for women on Shavuot night. Like every festival, Jews in the Diaspora have an extra day on Shavuot than the Jews in Israel. There is some debate whether or not you should stay up the second night as well, but the opinion of most rabbis19—and the custom of Chabad20—is that we do not (phew). Many have the custom to go to the mikvah a few minutes before daybreak to immerse themselves.21 This is the Chabad custom as well. Let’s take a moment to talk about the story we quoted earlier in the Midrash about the Jews sleeping in on the first Shavuot. Imagine for a moment that you were there. Some 3,000 years ago, you’re there in the desert the night before G‑d Himself gives us the Torah. You’re probably a little uncertain what to do the night before such an event. So you ask around, and your friends tell you that they’re going to get a good night’s sleep. Seems reasonable, right? The thing is, how much sleep do you actually think you’ll get? When we go to sleep early before a big event, we usually don’t get that good night’s sleep we’re craving. We toss, we turn, we get up, we go back to sleep. Maybe we cram in an hour or two of shut-eye. We’re too pent up—too excited, too nervous—to really get any sleep in. But the Jewish People did. They slept like babies—so well, in fact, that they slept in the next day. The fact that the night before G‑d was going to give them His infinite Torah, they were able to sleep so well, seems to imply that they were genuinely not excited or even overly enthusiastic about the event. There’s a problem with that, however. The Jewish people were excited for the giving of the Torah. They were so excited that 49 days beforehand—almost two months—they began counting the days to the giving of the Torah. And they weren’t just counting the days. Kabbalah explains that, during each one of those days, the Jews worked on a different personal characteristic, refining it, elevating it, painstakingly working on it until they’d managed to make it pure. They did this for 49 days, with the goal in mind that in 49 days they would have completely refined their entire personality. They were so enthusiastic about accepting the Torah that they were willing to completely reinvent themselves in preparation for it. And yet, on the night before the giving of the Torah, 49 days later, the night before the event they’d been waiting for for so long, they went to sleep. And slept perfectly, without a sound. And slept in. The Lubavitcher Rebbe explains that we’re misunderstanding this story. The Jews didn’t go to sleep out of apathy; they went to sleep out of enthusiasm. To explain this, let’s take a moment to talk about sleep. Since the dawn of time, countless philosophies have dealt with a question: what happens when we sleep? Kabbalah has its own explanation. When we are awake, our soul stays inside our body, animating our thoughts, actions and emotions. When we sleep, however, the soul leaves the body, leaving behind a mere remnant—just enough to keep us alive. The rest ascends to Heaven and learns Torah with the angels and other souls there. Then, right before we wake up, it returns. Now, though this happens to everybody, how much the soul learns in Heaven—and how much is remembered – is dependent on how much we studied during the day. Now let’s come back to the Jewish people in the desert. For 49 days, the Jewish people had worked upon themselves, refined themselves, elevated themselves. At that moment, the night before the Torah was to be given, they were holier than they’d ever been. And they were unsatisfied. They were unsatisfied because they felt it wasn’t enough. No matter how much they worked on themselves, they were limited people, trapped by the physical confines of the body. How could they, as coarse, corporeal beings, ever be ready to accept the Torah—the height of spirituality? They needed one more preparation—something that would really express their readiness to accept the Torah. For one night, just one, they wanted to experience something truly spiritual. And so they went to sleep. They lay down, left their bodies behind, and let their souls ascend to Heaven to learn Torah. They experienced a truly spiritual revelation—the experience of sleep, as witnessed by the genuinely righteous. This preparation, the complete divergence of the physical and the cleaving to the spiritual—this was their final preparation for the Torah. Yet now we must understand a different issue. If this was what was going on in their mind, what was the problem? Why was it considered a sin? Why, over 3,000 years later, are we still trying to rectify what they did? Their mistake, the Rebbe continues, was that, by going to sleep, the Jews demonstrated that they had completely misunderstood the point of the Torah. The Torah wasn’t given to us so that we can become spiritual beings, devoid of all vestiges of physicality. If that was the goal, G‑d would have been better off giving it to the lofty angels. Instead, the purpose of the Torah is for us to use it to elevate and refine this physical world. Judaism isn’t found in the songs of angels or in the piety of ascetics. Judaism is in the struggles of our desires—in getting up early to pray, in giving charity at work, in staying up late to learn a verse or two. Judaism is working with our physical nature and, little by little, civilizing it, refining it, and, ultimately, elevating it. By going to sleep—by opting to choose the spiritual over the physical—the Jews demonstrated that they had missed the entire point. Shir Hashirim Rabbah, ch. 1, pg. 12b. In Zohar, Parshat Vayikra, pg. 23a., Rabbi Yehudah and Rabbi Yosi are mentioned by name. Hakdamut, pg. 8b. Parshat Vayikra, pg. 23a. Parshat Emor, pg. 98a. Recorded in the Shnei Luchot Habrit (Shelah), beginning of Tractate Shavuot. Shaar Hakevanot, Drushei Shavuot, drush 1. Shulchan Aruch HaRav, ch. 494, halachah 3. In the Shelah (see footnote 5), it states that everyone does it. Shulchan Aruch HaRav, ibid., states that you should focus on Oral Torah. Shaar Hakevanot, ibid., says to learn specific verses from Tanach, parts of Mishnayot, and then spend the night learning Kabbalah. Netei Gavriel, ch. 14, halachah 5. The Chabad custom is to say the Tikun, but without the blessings found in the text, Otzar Minhagei Chabad, page 295. Netei Gavriel, ibid., footnote 6. Ibid., halachot 5 and 7. Ibid., chapter 16, halachah 3. Ibid., halachah 5. See footnotes 5 and 6 ad loc. for an overview of the debate. Otzar Minhagei Chabad, pg. 297. Netei Gavriel, ch. 16, halachah 15. Based on Likkutei Sichot, vol. 4, pg. 1024-1027. Wow! This article is interesting because I never really understood why we studied all night. I wish to study this Shavuot with intensity. It is such a joy to know that we can fix a mistake we made way back then. woman as well? Since the learning is a time related matter, I was wondering if women are also suppose to stay awake all night? TO: Akiva The tikkun is comprised of the beginning and end of every Parsha (weekly Torah reading), as well as selections from other parts of the Tanach, Talmud, and Zohar. It also includes a list of the 613 Mitzvot.